Ojo por diente presents two old display cases that look as if they had come from an ethnological museum. Above the left-hand one is a photograph of a bespectacled anthropologist; in the case itself, somewhat lost, lie his spectacles. 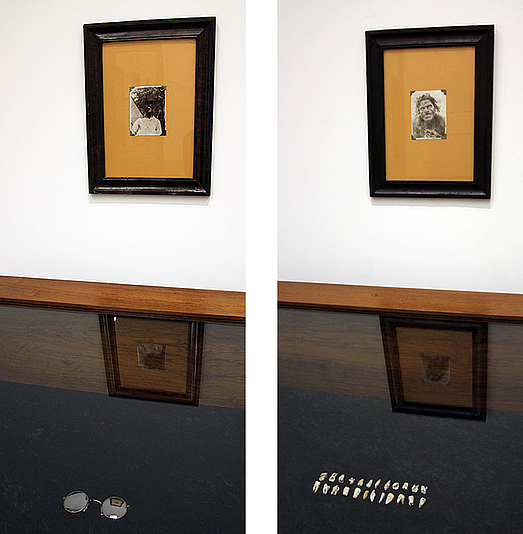 Above the right-hand case is a photograph of a "savage" baring his teeth, and as a counterpart to the glasses, neatly and delicately arranged and numbered: his teeth. Who cannibalized whom? Who is devouring whom, even today?